Some say there’s no such thing as a new idea, which is just a nice way of saying that humans are a staggeringly unoriginal bunch. 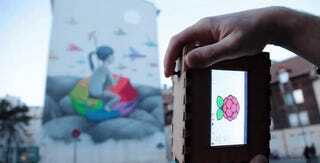 But a nifty, homemade Raspberry Pi-powered “camera” takes this idea and turns it on its head. Le Myope, created by French duo Salade Tomate Oignon, isn’t really a camera. It’s more of a regurgitation machine. According to a lofty, somewhat vague description from its creators, it uses machine learning to search for and find images that match the scene the user captures. So instead of spitting out original images, the Raspberry Pi-powered gadget finds similar-looking shots already in existence. Salade Tomate Oignon is the same team behind Layer Cam, a similar concept. The Layer Cam used GPS coordinates and Google Image Search to produce a stranger’s photo of a landmark or place instead of an original photo. Like Layer Cam, the French team also published the list of materials it used, as well as the code, so you can build your own if you’re feeling creative this weekend. And when you do, be sure to take lots of photos of phallic-looking objects and see what the camera spits out.